CNET UK has tested the Epson Stylus SX610FW four-in-one wireless printer that lets you fax and scan. The printer uses individual inks so one should be able to save a bit money on ink costs. CNET UK gives the Epson Stylus SX610FW a pretty good review where the printer scores 7.9 points out of 10. The reviewer likes how easy it is to set up the printer and it is able to make text prints of excellent quality, but on the downside the Epson printer makes photos that are a bit dull. Seems like a good choice for businesses wanting an inkjet printer. 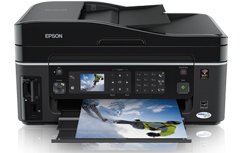 Read the full review of the Epson Stylus SX610FW printer here.